As we move in to a new year, we look back at the past year and decide what we want to focus on in the year to come. Victoria Real Estate in 2016 broke records, and demand is forecasted to continue in the year ahead. 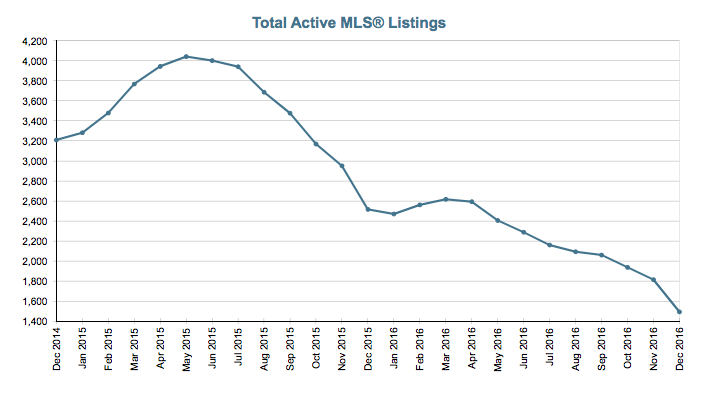 We are seeing over 40% fewer active listings now than were on the market at the end of December 2015, with supply that low, it’s no wonder why demand is expected to continue in the coming year. As for condos, the average sale price of a condo has gone up just over 20% over 2016. The number of active condo listings has drastically decreased, at the end of December this year there were only 186 condos available on the market, compared to 499 at the end of December 2015.